Still looking for that special sweet treat for your loved one? 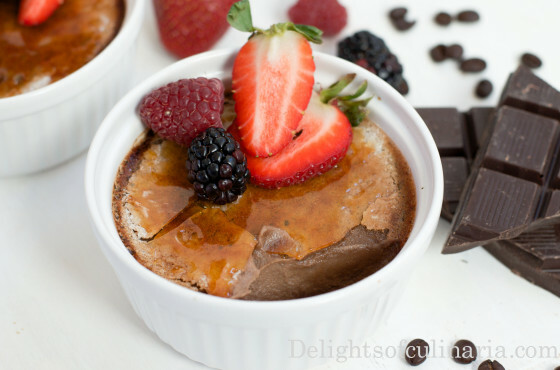 Chocolate creme brûlée is a divine and luscious romantic dessert that will be perfect for valentines day or anniversary. It’s one of those very easy and elegant desserts with fancy name and amazing taste.Both chocolate lover and non chocolate lover will enjoy. 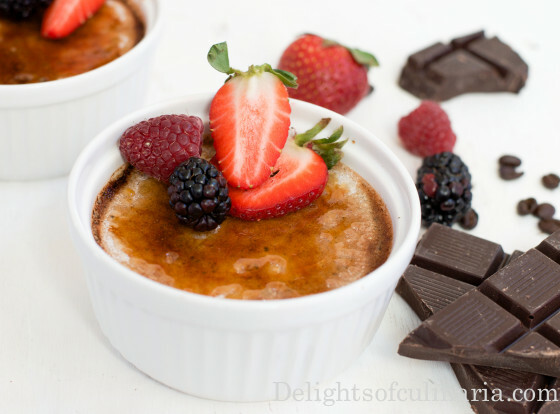 And if you really dislike chocolate you can check this recipe for classic creme brûlée. 2 ounces espresso or 1 tablespoon instant coffee. 4 tablespoon sugar for topping. In a saucepan,heat heavy cream until begins to boil. Beat egg yolks with sugar. Remove from heat and gradually whisk in chocolate,coffee,and kahlua. Gradually, by dribbles at first whisk in hot cream mix to egg yolks. Divide custard among 4 ramekins (if you have smaller ramekins, you might need 6-8 of them). Place ramekins in large baking dish. Add enough hot water to pan to come halfway up sides of cups. Bake until custards are set, about 30-35 minutes. Remove from water; chill 2 hours. Sprinkle each custard with 1 tablespoon sugar. Broil until sugar turns golden, watching closely to avoid burning, about 3 minutes. Refrigerate until custards are set, 1 to 2 hours. Use a kitchen torch to caramelize sugar instead of using the broiler. In a saucepan,heat heavy cream until begins to simmer. This looks so good, and now I’m craving Creme Brûlée :). Thank you!!! Same happens to me when I see creme brûlée.My favorite! Thank you so much for mentioning that.Im really sorry.I fixed it.